BEST-VIP’s variety of different capacity deluxe minicoaches are great for smaller or mid-sized groups offering luxury, comfort and cost savings! Perfect for intercity transport, schedule a minibus for your group that goes everywhere you go, giving you the flexibility to utilize it as needed. Our minicoaches are also able to take you across state lines, with amenities not offered in standard vehicles. BEST-VIP’s deluxe motorcoaches make for the perfect charter bus rental for any group requiring additional comfort and space. We work with a variety of deluxe group charters, including; conventions, universities, sports teams, churches, K-12 schools, and more! Luxury motorcoaches are a perfect transportation solution for events, holiday parties, corporate celebrations, or corporate road trips. Motorcoaches are an ideal alternative to a traditional bus for field trips, meetings, or larger groups either locally or throughout Southern California. 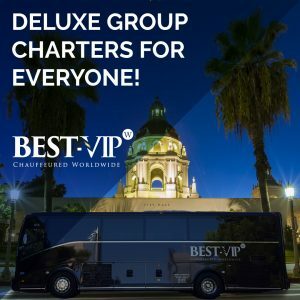 Deluxe group charters are much more comfortable, not to mention stylish, alternative solution for groups of all sizes, offering several amenities and entertainment options that are not offered on traditional buses. Motorcoaches are also economical, with the ability to fit more passengers in a single trip, creating a lower cost per person than would be available for individual private vehicles. We choose the best, safest, and most reliable vehicles available in the industry and enhance them with onboard modern and luxury features for increased passenger entertainment and comfort. Whether you are traveling in Orange County, Southern California or even Globally, BEST-VIP Chauffeured is the only transportation partner you need. While we regularly service Orange, Los Angeles, Long Beach, Riverside and San Diego Counties we also partner with a Global Affiliate Network that expands our service around the globe, without foregoing our standard of service. BEST-VIP offers our customers multiple options for an easy booking process. Call our office directly, email our reservations and group sales departments, go online and request a quote for bookings, or have your travel agent book a reservation through the GDS. No matter your preferred method of communication, BEST-VIP’s team is always available to assist you and we pride ourselves on responding promptly to any customer inquiries or requests. Book with us today!